An age old question asked by many to this day, as it was the first-person shooter Crysis that stressed your PC like no other with its highly complex graphics engine: the Cryengine 2. If you could play Crysis on high settings or above you could play anything. Wearing the almighty “Nanosuit”, you would sneak around and fight your way through a lush, topical island filled with North Korean soldiers to stop a terrible alien power from being unleashed onto the world. 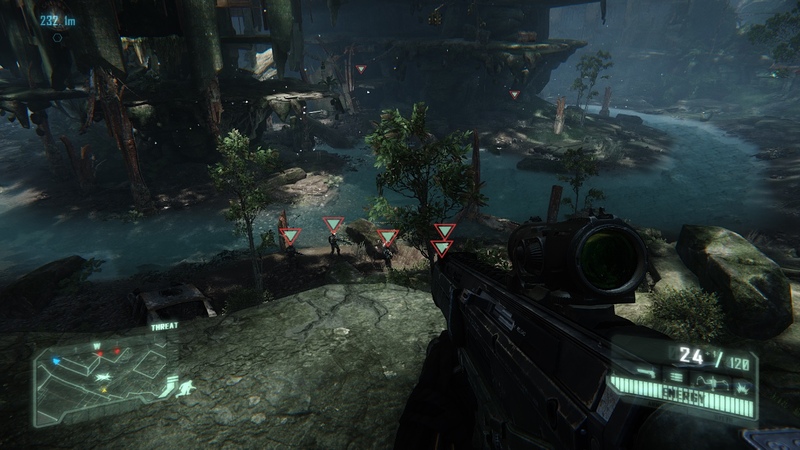 The action continued with the expansion pack to Crysis: Crysis Warhead. Crysis 2 was released much later as a multi-platform title with the brand new Cryengine 3 and moved to the streets of New York. The storyline became more complex with evil corporations, alien invaders and shocking revelations to provide an even stronger story-based experience. Both games have received praise for their beautiful graphics and enjoyable gaming mechanics. However Crysis 1 was criticised at the time for it’s high requirements and poor engine optimisation. 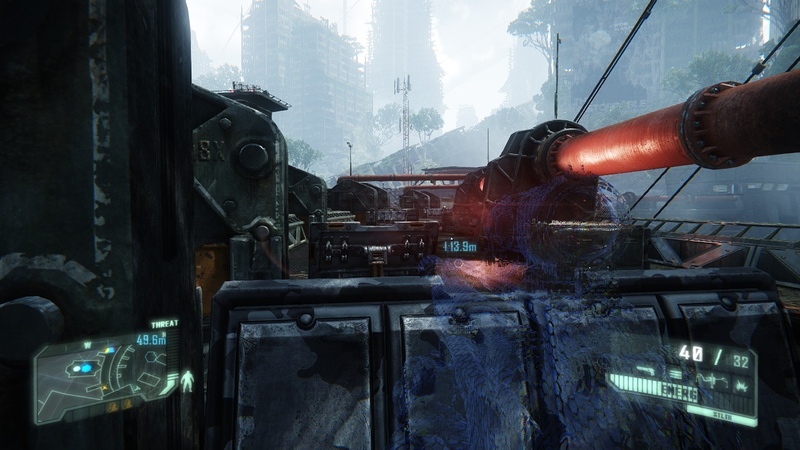 Crysis Warhead received the same criticism as well as not adding anything new to Crysis. Crysis 2 was criticised by PC users for being a direct console port and the new environment didn’t please fans of Crysis 1 at all. 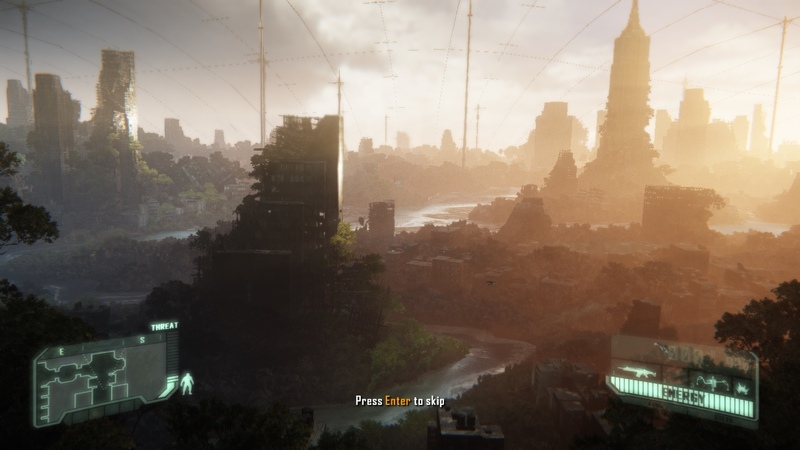 Crytek has now released Crysis 3 which promises to fix for PC gamers what Crysis 2 failed to deliver on and deliver the same feeling that the first Crysis and it’s expansion had. The Cryengine 3 has gone through a complete overhaul to provide the best possible graphical experience on both PC and console. With the same features as it’s predecessors along with a few surprises of its own, Crysis 3 hopes to deliver intense and action-packed gameplay as well. It’s been 24 years since the invasion of the Ceph. The organisation “Crynet Enforcement & Local Logistics” (C.E.L.L.) have expanded their power and influence to the point where no one is able to stop them. They have created a giant “Nanodome” covering all of New York now enveloped in tropical wildlife to kill off the rest of the Ceph. 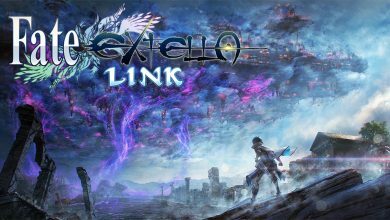 However some learn of C.E.L.L.’s true intentions and begin a resistance movement lead by Psycho, a former user of the Nanosuit and comrade of Prophet. Psycho and a team of insurgents soon find Prophet in his Nanosuit, placed in Cryogenic Sleep. Prophet awakens and discovers what has been happening during his dormancy. Prophet must now utilise the full power of the Nanosuit to destroy the Ceph and stop C.E.L.L. taking over the world. You’re once again given control of the Nanosuit which gives you abilities like cloaking and enhanced armour. The setting takes place quite literally in an Urban Jungle, as tropical flora and fauna has engulfed New York. You’ll be using the powers of the Nanosuit to subdue many of the C.E.L.L. guards patrolling the environment and the remnant Ceph stalking through the jungle attacking both you and C.E.L.L.. Moments when entering areas with dozens of enemies feels very tense as you clearly see that you’re outnumbered. Nevertheless using the Nanosuit and your arsenal to their fullest extent to overcome these odds will always having you coming out on top. Areas are very large, giving you perfect hiding spots and vantage points where you initiate your plan of attack. Do you give enemies the slip without them ever noticing? Do you dispose of them with stealth kills, diversions and traps? Or do you charge in with brute force and show no mercy? Weapons from Crysis 2 have returned and once again you can add attachments to them such as scopes and silencers to improve their effectiveness. You’re also able to upgrade your Nanosuit by collecting modules which will give you points for purchasing upgrades to your reflexes, your endurance, your stealth ability or the strength of your armour. You can also unlock further attachments to your weapons such as bayonets and under-barrel grenade launchers. New weapons have been added including powerful Ceph weapons that only you can use. One other new feature is the hacking ability, which if used successfully, can open locked doors, disarm minefields and turn unmanned turrets on the enemy. The most prominent new addition is the deadly Predator Bow. This weapon includes various arrow types, different draw weights effecting the power and speed of arrows and gives the user the ability to remain cloaked without energy loss. All these new tools helps you use the environment to your advantage, allow you to adapt to various situations and utilise cunning tactics to exploit the enemies weaknesses and subdue them before they even know what hit them. Crysis 3 also offers a very entertaining multiplayer. Players have many choices of gametypes but the one that stands out is Hunter. One player is cloaked and armed with the Predator Bow and the others must find that player before he kills everyone in the game. It’s a very thrilling, eerie experience and a lot of fun. 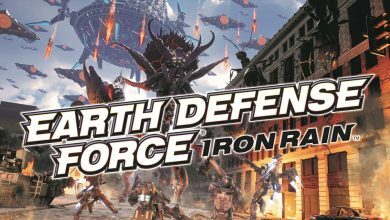 You gain experience points as you play multiplayer enabling you to rank up and obtain Suit Modules which enhance your skills, armour and grant support bonuses such as calling in a Ceph Gunship or an Orbital Strike. 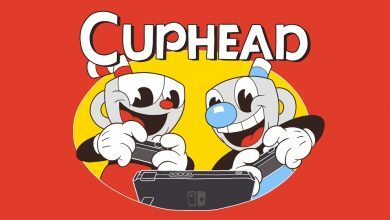 The game’s multiplayer doesn’t attempt anything too original, but it’s fast-paced, it’s intense and it’s fun enough to keep players coming back for more. 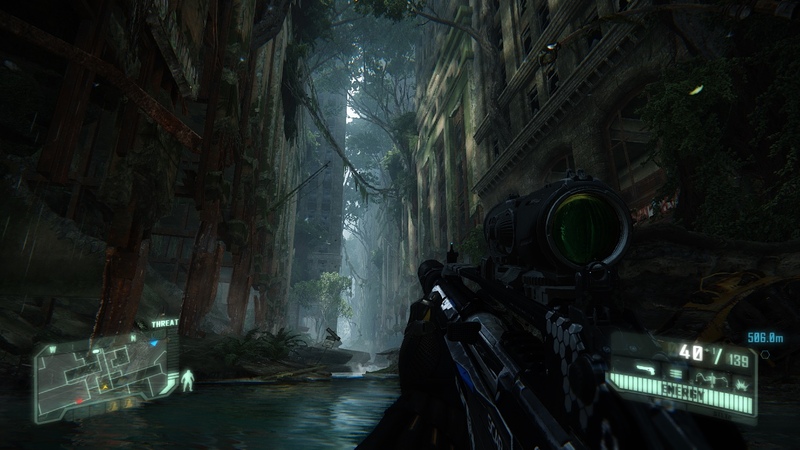 Crysis 3 looks without a doubt, absolutely glorious. 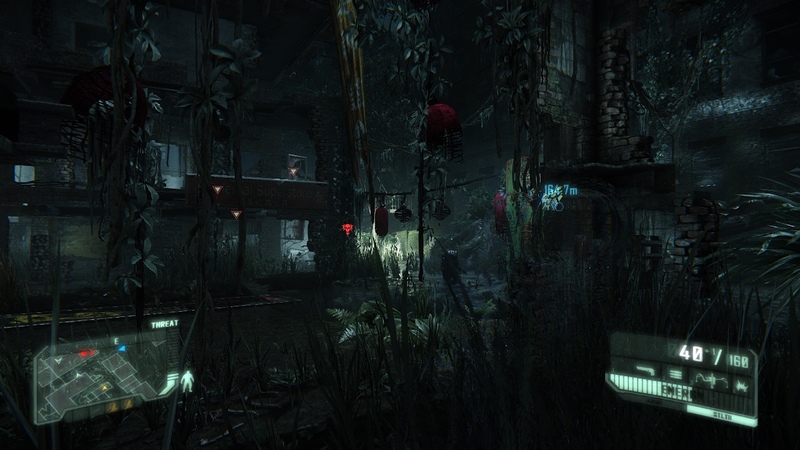 The Cryengine 3 has pushed Crysis 3 to the limit and the result is nothing short of astonishing. The effects, the environments, the character models, the detail level, everything looks simply amazing. The Crysis games have always been able to deliver superb graphics and this is especially impressive. On the PC even in you’re playing on the lowest graphics settings the game still looks amazing. Sound production is also a strong point in this game. 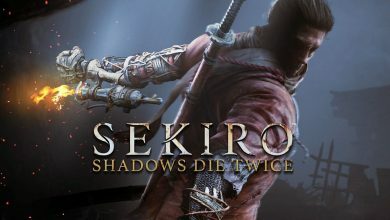 Ceph and human weapons resonate powerful blasts, the game’s great soundtrack adds atmosphere and a cinematic flair, the voice acting is very good and all this working in unison shows some incredibly high, cinematic production value. 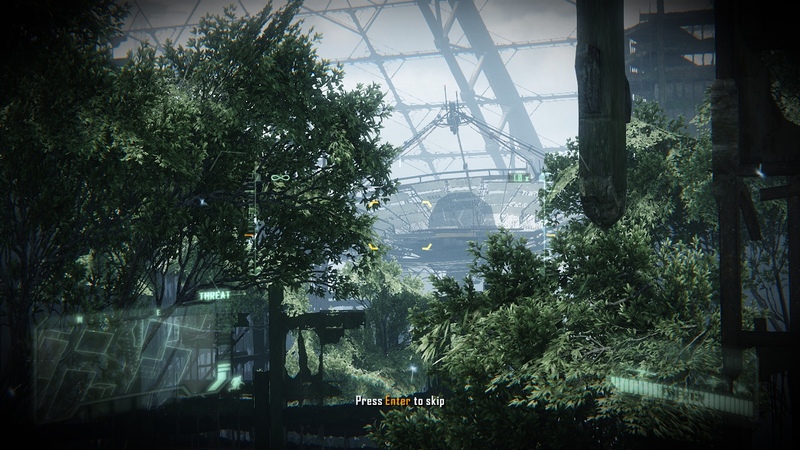 Crysis 3 has indeed taken some steps forward when it comes to gameplay and graphics. The new additions adds some varied gameplay and this Crysis is the best looking one in the series. However compared to the other Crysis games and even other first-person shooters, it also appears to have gone back on itself and missed some chances to make this the best Crysis game yet. Crysis 3 has more varied gameplay than it’s predecessor, but still both Crysis 2 and 3 feel very similar to each other. The core gameplay appears and feels the same and this new Crysis game doesn’t really stand out from the others. There’s no ambitious feats to be found in Crysis 3. It doesn’t try anything that hasn’t already been done in other first-person shooters. The Crysis games have always had of reputation for being very bug-ridden and in Crysis 3 those bugs have returned. As you watch enemy guards patrol the area, you’ll notice that their animations look unnatural since it appears like they snap from one motion to the next. Their ragdoll animations can make them fall in awkward positions when killed. Weapons dropped may partly disappear through the floor and sometimes even characters partly disappear through the walls. The physics engine can cause some really strange occurrences, like inanimate objects floating in the air. Enemies can do weird things like stand straight up underwater while being able to shoot you from there. Another major problem that has plagued the Crysis games is the brain-dead Artificial Intelligence. Sometimes they put up a good fight, other times you’ll wonder how C.E.L.L. was able to gain power with such a stupid army. You’ll find enemies noticing you and saying they’ll investigate before immediately going back to doing whatever they we’re doing. Sometimes they’ll “discover” where you’re hiding even though you completely obscured and on a different side of the map then start shooting randomly in any direction. During firefights some of them will be just standing there aiming their weapon at the threatening wall or shout for covering fire and backup without ever firing their gun. 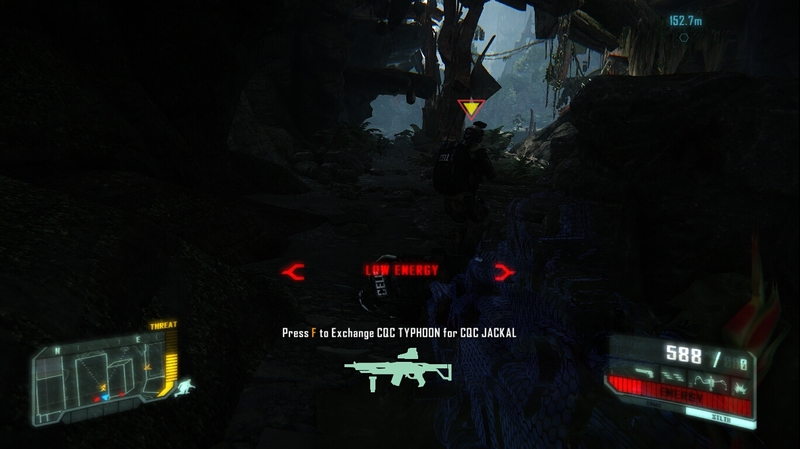 The Crysis games are known for their lengthy single player campaign. Unfortunately for Crysis 3, that’s not the case. 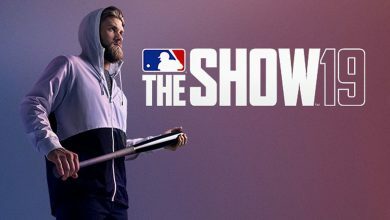 The single player campaign can take around a disappointing 4 – 6 hours to complete. 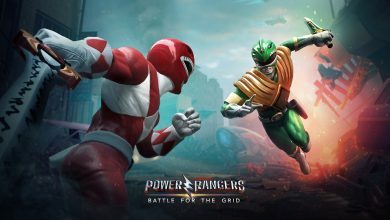 There is the chance to replay on higher difficulties and unlock more equipment, but the gameplay will remain the same and perhaps be even easier with your new upgrades. Multiplayer offers some good replay value as it’s very entertaining and there’s much to uncover. Apparently mod support has greatly improved from Crysis 2 even though no SDK has been released yet. But if it does the modding community will surely have ideas in mind to add new experiences and keep the player coming back for more. 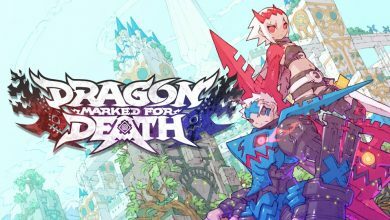 The game does a rather good job presenting complex characters with their own reasons to fight, making the game a more personal experience. Your character Prophet feels like he’s alone and in a sense, the last of his kind. Even his allies see him as more machine than man, which makes him desperate to cling on to his remaining humanity. His friend Psycho is still mentally scared from what he went through at the hands of C.E.L.L.. Psycho’s girlfriend Claire resents Prophet and refuses to call him by his name. Crysis 3 has character, but it lacks plot. Players will notice that the story has gaping inconsistencies and plot-holes, especially if they’ve played the previous Crysis games. The length of the campaign doesn’t help the story much either since after 4 – 6 short hours, the entire struggle for freedom is quickly forgotten. Crysis 3 hasn’t really pushed the Crysis series or even first-person shooters in a whole new direction. It attempts to rectify the issues that the previous Crysis games had without deviating too much from the Crysis formula. 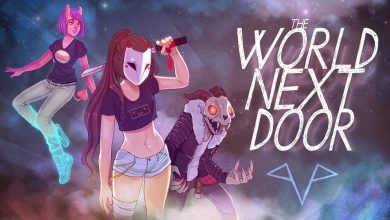 This game could have been a bit more ambitious and tried to introduce something new into the genre. Even so, what the game offers is substantial enough to keep players entertained. It looks stunning, it’s intense, it’s varied, it’s fun and on those points alone, it’s actually worth giving a shot. This review was based on a retail copy of Crysis 3 for the PC provided by EA.